First of all, a most warm welcome to the Chinese Embassy! It is such a pleasure to have you all with us today for the "Weaving A Dream" Fashion Show. This is the second fashion show that the Chinese Embassy is hosting in the past five years. I am sure this time it will be just as fascinating and inspiring as the last one. Fashion show as a form of stage art is most closely related to the real life of the people. However sumptuous, fashion designs are always based on and reflect our everyday life. Tonight, it is a great pleasure to have with us the seamstresses from Qianxinan in China's Guizhou Province. They will share with us their folk art in the form of a very unique fashion show. But most importantly, in the language of fashion, they will share with us their dream. First of all, this is a dream to carry forward the culture heritage of the ethnic minorities in the mountains of Guizhou. Guizhou Province is known for its diverse ethnic cultures. Qianxinan Prefecture in Guizhou Province is home to the Buyi minority group. The traditional costume of the Buyi minority is highly appreciated for its long history and distinctive features. In recent years, the rapid economic development and the influence of modern life have posed a challenge to preserving and promoting the Buyi costume culture. Fortunately, the local government, the business community and people of many different backgrounds have come together to lend their support. The younger generation of seamstresses are working hard to keep the Buyi minority traditions alive, including unique embroidery techniques, folk crafts and costumes making. Tonight, they are here to demonstrate the beauty and appeal of their very unique culture. Second, the seamstresses' dream represents the aspiration and efforts of the people in west China to shake off poverty and build a better life. Since China began its reform and opening-up, 700 million people have been lifted out of poverty in 30 years time. In the past three years, at least 10 million people per year were helped out of poverty and our goal is to eradicate abject poverty by 2020. China is still a developing nation, where poverty is still a problem especially in remote mountains. In Qianxinan Prefecture where the seamstresses come from, poverty reduction remains a daunting task. There are seven poor counties in the Prefecture, where people, especially women, are still living below the national poverty line. But we Chinese believe that "Rather than handing out fish to the needy, it is better to teach them how to fish." Thanks to the government policy of targeted poverty relief and the helping hand from enterprises like the EVE Fashion Group, we now have a creative way to "teach people how to fish". Efforts to revive the craft skills and to create a contemporary commercial model for the traditional designs gave the women of the Qianxinan mountains new livelihood opportunities. With a stable job, they can now depend on themselves for a better life. Last year in Qianxinan, three of the seven poor counties, 132 villages and 100,000 people were out of poverty. This was a remarkable achievement and such a strong boost to our confidence in accomplishing our poverty reduction goal by 2020. The third dream the seamstresses from the mountains of southwest China are able to weave in London is a great accomplishment of the exchanges and mutual learning between Eastern and Western civilizations. Guizhou is a landlocked province in southwest China. But for 2,000 years and more it has been on a major passageway linking China and the world. That was the "ancient tea horse road" and "southern silk road" over China's Yunnan-Guizhou Plateau. Via this route, silk and tea from China reached as far as South Asia. Today, as China advances the building of the Belt and Road, Guizhou is again showing its geographical advantage. It is becoming a leader in facilitating win-win cooperation, cultural exchange and friendship between the east and the west. Tonight, let us be amazed by the beauty of Buyi brocade and the splendour of the fusion between eastern motifs and western fashion. 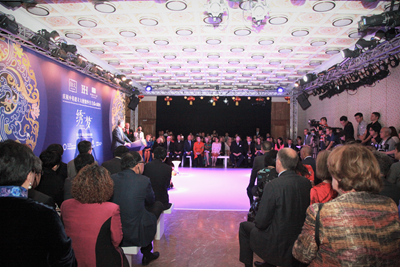 Last but not least, the dream is about deepening China-UK cultural cooperation and people-to-people exchange. 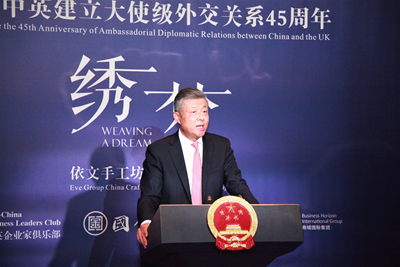 This year marks the 45th anniversary of Ambassadorial diplomatic relations between China and the UK. It is also a year for consolidating the China-UK "Golden Era". London is an international city of fashion and creativity. More and more Chinese fashion companies are coming here. The EVE Group is a fine representative. I am most pleased to see that both Chinese and British business leaders from the fashion industry are gathered here to exchange ideas and explore opportunities. This will not only help build stronger ties between the cultural and creative sectors of our two countries. It will also contribute to the mutual understanding and friendship between our two peoples and deliver more "golden fruits" in the China-UK "Golden Era". John Keats once said, "A thing of beauty is a joy forever." I sincerely hope everyone present will cherish this night at the Embassy. I hope you will enjoy the beauty of fashion and the beauty of the Chinese culture. I hope we can all work together to weave the dream of closer and more fruitful China-UK cooperation.